Check out Tobi's Late Night Sequin Bodycon Dress You're going to have one night to remember when you wear the Silver Late Night Sequin Bodycon Dress. Sequin lovers, you're going to want to show off this criss cross open back dress at all your evening festivities. 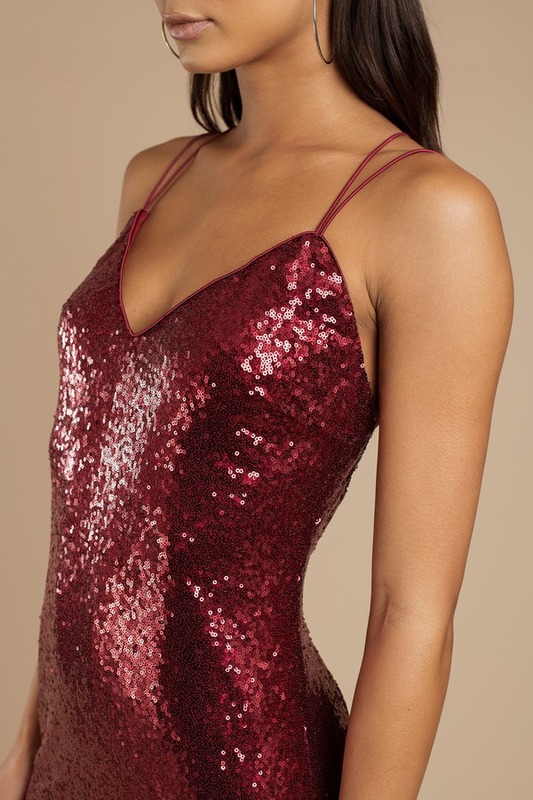 You're going to have one night to remember when you wear the Wine Late Night Sequin Bodycon Dress. Sequin lovers, you're going to want to show off this criss cross open back dress at all your evening festivities. You're going to have one night to remember when you wear the Gold Late Night Sequin Bodycon Dress. Sequin lovers, you're going to want to show off this criss cross open back dress at all your evening festivities. You're going to have one night to remember when you wear the Silver Late Night Sequin Bodycon Dress. Sequin lovers, you're going to want to show off this criss cross open back dress at all your evening festivities. Gold, Silver, Wine modeled on a size Small.